ClayPolish is a post-process operation which alters the topological structure of your model and moves its edges based on various settings. It has the effect of polishing the surface while sharping and cleaning the angles. It can also create special effects on the model edges. It can easily simulate the feeling of clay or other raw materials. It can also clean the visual aspect of your model; especially when combined with DynaMesh. Using ClayPolish is simple: enter your desired settings and then apply ClayPolish to your model. The feature works with both PolyMesh3D and DynaMesh surfaces. In fact, DynaMesh’s “Polish” mode will automatically apply ClayPolish each time the topology is updated. Click on the ClayPolish button to apply effect to your model. The effect will use the parameters explained below. The Max Angle slider defines the surface angle at which ZBrush will apply polish. For example, the default angle is set at 25. This means that any portion of a mesh that has an angle higher than 25 degrees will be smoothed. The Sharpness slider controls the intensity of the overall sharpness that is applied to the angles during the polish cycle. This can result in a significant surface change. This slider will also work in conjunction with the RSharp slider explained below. The Softness slider controls the intensity of the overall softness that is applied to the mesh surface during the polish cycle. This will give more of a smooth transition across the mesh when its value is increased. This slider will also work in conjunction with the RSoft slider explained below. These sliders specify the number of times to repeat the sharpening or softening effects defined by the Sharpness and Softness settings. For example, a lower softness effect applied multiple times will have a different result than you’d get with a single softness application at high strength. The Edge Contrast slider can be given positive or negative values. 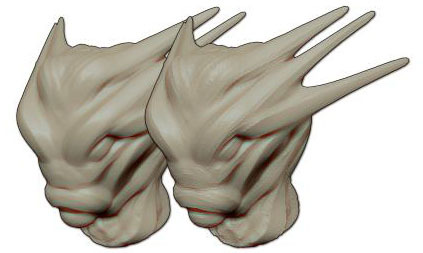 Positive settings will inflate the polygons along the edges of the model while a negative setting will deflate these polygons. Surface Contrast behaves in a manner similar to Edge Contrast but affects the surfaces between the edges. Positive values inflate these surfaces while negative values deflate them.